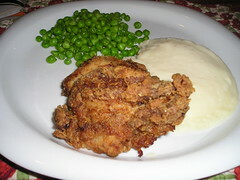 Every now and then, I just have to have fried chicken. This is from Wegmans, and I even fell for the mashed potatotes (which kind of melted when reheated). I like a little honey with the chicken, a holdover from KFC days, even though I know that was supposed to go on the biscuits. I just drizzle it on the crispy crust. And I always pick thighs, because they don’t dry out and have the most flavor. Drumsticks are good too, but I really like the thigh best. And I know that little pile of peas looks pathetic, but I just had to have something green on the plate, and I have a tendency to omit that. So I’m keeping frozen veggies handy in the freezer, so I have no excuses!